Ah, Dragon Age 2. Playing that game has something of coming home. It was my first complete RPG game and I still love it very much – despite the repetitive mazelike houses and caves (which I totally blame on Varric’s bad visual imagination; the story is after all from his perspective) and the really annoyingly long fights. The fights are way more action focused and direct than in DAO but I mean, seriously. People just continue to pop out of thin air and a harder gameplay just equals more and more enemies instead of smarter ones. Just annoying. That’s why I love the storymode mod so much, people drop dead like flies with one hit. And while the fights are exciting in DAO, they’re really just annoying in DA2 and I do not play it because of the fights. Really not. Neither do I play it because of the HUGE weapons (which reached a ridiculous size in DA2) nor because of the general “Let’s overdo stuff!” feel of many aspects. Let’s talk blood. One of the first and most important things I do is turn off the gore. It’s not gory, really not, it’s just ridiculous. 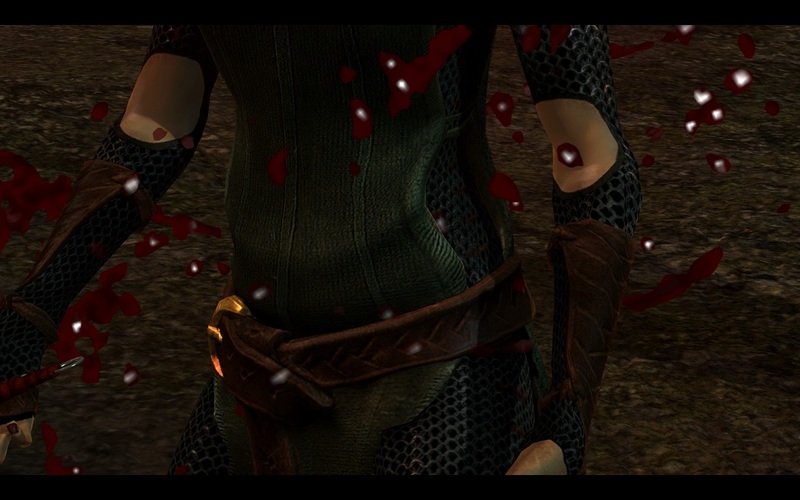 Every small cut splatters the whole group with blood which stays on them until the next cutscene. Often including on their teeth. No, I play and love it because of the characters. Anna already wrote about it in her first article – the voice acting is amazing. Both Hawke and her companions are just awesome. The dialogues are so good and Hawke has so much personality, it really is a joy. And the story is so personal! While I had my problems connecting with my first Warden – not with Fian but my original Warden – I had no problem whatsoever to immediately like, then love and very very soon feel with Hawke. Meet the Hawke family. Whoever threatens them will get hurt. Starting DA2, I quickly realized how different the two games play themselves. I could never play DAO under one hour, while a quick ten to fifteen minute “break in Kirkwall” is very easily managed. Very much more than DAO, DA2 is really casual game, at least in the first Act. Basically, the first Act’s story is “Get to Kirkwall, then get 50 Sovereigns and a map to the Deep Roads and go on an expedition to get rich”. The “Get to Kirkwall” part is basically over in ten to fifteen minutes. In these few minutes, we fight Darkspawn, meet Aveline and her soon-to-be-dead husband, fight more Darkspawn and then lose Carver. For which we are blamed by Leandra. After Carver’s death, we meet Flemeth, during which there was the most creepy bug: A scene where Hawk talks to Flemeth and you see Leandra with the dead Carver in the background – who is, for some reason, suddenly naked from the waist up and looks at Flemeth. And blinks. Then he’s dead again. Kind of took the drama out of the scene. Afterwards, Aveline has to kill her husband who is infected with the Taint and just like that puts a dagger straight through his own breastplate. Well. If his armor gives way like melting butter, it’s no wonder he got infected. Just saying. One of my favourite warrior women ever. Next for the part “get 50 Sovereigns and a map to the Deep Roads”. And while we do that, we’ll collect our awesome companions. Whee!